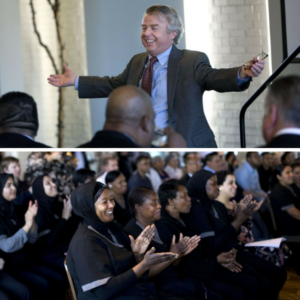 GREENSBORO — The company that operates the O.Henry and Proximity hotels, Lucky 32 in Greensboro and three other restaurants now is owned by the employees who make the beds, clean the rooms, cook the meals and serve the food. Chief Executive Officer Dennis Quaintance told a room full of his energized colleagues Thursday morning that he and his partners in Quaintance-Weaver Restaurants and Hotels had passed the baton of ownership to an employee stock ownership plan that is, essentially, a retirement fund for the people who work there. Quaintaince, 59, began this hotel-and-restaurant operation 28 years ago with Greensboro businessman Mike Weaver by opening the popular Lucky 32 restaurant on Westover Terrace. His wife, Nancy King Quaintance, joined the team several years later. They added the two hotels and several restaurants over the years, and the Quaintances said Thursday that they will continue to lead the management team under the new business structure. An employee stock ownership plan gives a company’s employees a tangible stake in the company, building retirement benefits that they can convert to cash in later years. All employees, including management, are part of the plan and they reap its benefits in “retirement units” each year. Those units each are revalued on the company’s annual profits and divvied up among employees based on their salaries. “Highly compensated” managers have caps on how many retirement units they can receive in any one year. Such so-called ESOPs employ about 10 percent of the nation’s workforce in companies such as the Publix supermarket chain and Kohls department stores. Across the United States, about 7,000 companies operate in an ESOP format. Their advantages include increased employee productivity, much less turnover and several types of tax advantages for both the 600-plus staff members at Quaintance-Weaver and the company itself. Quaintance told his new partners that he and the rest of the company’s leadership team pursued the ESOP to ensure the organization Quaintance-Weaver employees have built would remain intact with the same goals and values. Quaintance-Weaver employees are eligible to participate in the new plan if they are older than 18 and work for the company more than 1,000 hours yearly. Their benefits are vested after three years on the job. The new ESOP plan includes workers of all types at the two hotels, the Green Valley Grill at the O.Henry, Print Works Bistro at the Proximity and the Lucky 32 Southern Kitchens in Greensboro and Cary. His audience was upbeat and seemed to appreciate the plan’s potential to, quite literally, enrich their lives in years to come. People who leave before retirement still retain their retirement account, which begins converting to cash payments five years after they depart. Green Valley Grill server Morgan Gneiser said that before Thursday’s meeting, staff members only knew the meeting’s focus would be on a new companywide benefit. Speculation was rampant and focused mainly on the possibility it was a 401-K retirement plan, Gneiser said. The ESOP plan seems likely to increase her loyalty to the company, where she has worked six years, said Gneiser, a Greensboro resident who is pregnant with her first child. The company’s main assets are its staff members, their skills and hard work and their institutional knowledge. As had been the case before the ESOP conversion, the hotel and restaurant buildings will continue to be owned by a real-estate partnership involving the Quaintances, Weaver and several others . In an interview earlier Thursday, Quaintance noted that he was making the ESOP announcement nine years “almost to the day” since opening the elegant Proximity along Green Valley Road, which he built with so many environmentally-friendly features that it became the nation’s first hotel and restaurant to receive highest honors from the U.S. Green Building Council. And Nancy Quaintance added that it had been nine years before that when they opened the nearby O.Henry, a modernized re-creation of its North Elm Street namesake — an architectural gem that had fallen into disrepair before its demolition in the late 1970s. “Every nine years, we do something really cool,” Nancy Quaintance said of the company’s newest twist. “We have a really long gestation period,” her husband said.